Here is an EXCELLENT update to what we know, and what we don't know about taurine induced DCM. This is an article by Linda Case, a canine (and feline) nutritionist. Really, really good information. Taurine-deficiency DCM in Cats: Looking back, I cannot avoid a sense of déjà vu. In the early 1980s veterinarians began reporting increased incidences of DCM in pet cats. By 1987, a role for dietary taurine was suspected. In a seminal study, a veterinary researcher at UC Davis reported low plasma (blood) taurine levels in 21 cats with clinical signs of DCM (1). When the cats were supplemented with taurine, all 21 completely recovered from the disease. This discovery led to a series of controlled studies that supported the existence of taurine-deficiency DCM developing in cats who were fed diets that contained sufficient concentrations of taurine. Our pooch Cayenne died Nov. 12, 2017 two years after being diagnosed with DCM. I'm posting on this taurine-related topic because a few months after she died I did an updated search on DCM to find out if there were any new articles on the topic and found https://vethospital.tamu.edu/files/h...alfBooklet.pdf. Then I read the posting here today where the poster stated that taurine supplements definitely helped his Doberman. Cayenne was our third Doberman, our first diagnosed with DCM, and her eating habits had been strange ever since we got her at 8 weeks old. She was always crazy about veggies. Never met a potato peel or a carrot peel or a pea pod she didn't like. Grazed on grass. Headed straight to the garden to start feasting whenever possible. None of our other dobies were ever that obsessed with veggies, they were all more carnivores. 20/20 hindsight, I think she may have been motivated by a taurine and/or L-carnitine deficiency that caused her to be constantly craving. I also wish I'd seen this information three years ago when she was diagnosed, maybe we could have managed more time with her. First, I'm so very sorry for your loss. Second, I wouldn't assume that there was a taurine deficiency, and you definitely can't blame yourself. In Dobermans, DCM is in all lines, and taurine supplementation is NOT proven to help with DCM or reverse the disease. Veggies are NOT an issue. 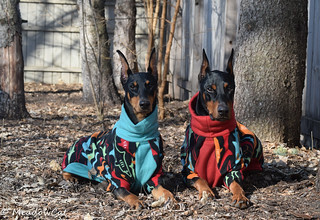 Please don't blame yourself or buy into headlines...this issue is VERY complex with the stuff coming out about food, and it is different than the genetic DCM that Dobermans develop. Additionally, despite the wide coverage, we are also still looking at a very small number of dogs. That doesn't mean we shouldn't pay attention and learn about it, but we also need to know that this is very complex, the vets and researchers don't know exactly what it is yet, and it's NOT a simple answer like taurine deficiency. dobebug and Saskdobie like this. I love this update--it sort of give me credentialed support for stuff I've recommended and/or done with and for my dogs for many years. It vindicates my decision (years ago) to feed my dogs diets they did well on unless there was some pressing need for a particular dog for a very specialized diet. It justified my decision to ignoer the various people who have insisted that I am killing my dogs because I have chosen to feed diets created and made by big feed companies (like Purina, Iams, Hills, and Royal Canin)--these companies (Purina for example) not only do extensive testing and evaluating what they put in their feeds, hire nutritionists trained for this but keep colonies of dogs who eat the diets and record the results to provide excellent results for your pet and mine. I'm not a fan of most of the computer generated diets--what looks good on paper often doesn't pan out in the dish of your dog or mine. I'd much rather know that real dogs are eating and finding palatable the diets formulated by companies like Purina. So I've fed most of the many years I've owned purebred dogs diets manufactured by the big feed companies, Kennelration back in the 60's when they were one of the biggest anufacturers, later Iams/Eukanuba, Hills Prescription Diets, and for a long time now I've fed most of my dogs ProPlan (Purina)--all of these have served me well as does the ProPlan Focus (Sensitive Skin and Stomach--the Salmon based formula). My now 13 year old Dobe was weaned on the adult formula and still eats it. He likes it, has bright eyes, a lot of vim and vigor for an old Doberman, carries good weight without having to feed a lot of it and his coat is a miracle (but I'll tell you that I regard that more as a result of genetics than solely of what I feed) since he's a fawn with a full coat--at 13. Does he have DCM? Yeah, he does--but he's been echo'd and Holtered regularly (yearly until he was 7 and twice a year since then) and we could see the slow deterioration in function--he's been on benazepril for years and on Vetmedin since he was 11. He gets fish oil and Vitamin E. I've had Dobes since 1959--I've had friend who were vet almost that long and long ago I knew about cardio in the Doberman--my very first dog was in CHF when he was 9--about the only thing available for treatment then was Lasix--but I was informed about the breed propensity for cardio long before most people ever heard of it. It's pretty certain that Doberman type DCM is largely genetic (and there are studies on that). And I've actually only lost two Dobes in the very nearly 60 years of dogs to DCM--the first and a fairly recent one whose Holters gave us every reason to believe that he was going to be a sudden death dog--and he was. But the rest of the dogs who were cardio dogs to one degree or another most often died because there was something else going on--and I had the said task of taking my dog to the vet so they could go where all the good dogs go, without a lot of pain and loss of quality of life. I hope every Dobe owner has a chance to read these two excellent reports that Meadowcat was kind enough to post. 4x4bike ped, ECIN and Saskdobie like this. I'm continuing to follow this very closely. I know a (non-Doberman) that is one of the dogs diagnosed with non-genetic, potentially diet-related DCM. It's very interesting to me to read and do my best to understand what is potentially going on, and this is possibly going to have massive implications for the dog food industry. What I'm learning is that it's not necessarily, really, a taurine issue - supplementing these foods with taurine does not solve the issue. It's more complex than that - the formulation of the diets themselves, the combinations of ingredients without actual nutritionists on staff, the lack of feeding trials at most dog food companies - it's a very complex issue. Nutritionists and cardiologists are working to understand what it is that may be causing this. I'm continuing to follow the developments and research on this. I think those of us that are really proactive in testing our dogs with echos and holters yearly are ahead of the game in detecting anything that comes up. For what it's worth, though, I personally decided to switch my dogs to Proplan. This thread has so much info in it...maybe we should make it a sticky, MC?? "Between January 1, 2014, and November 30, 2018, the FDA received 300 reports of DCM (294 canine reports, 6 feline reports); 276 of these (273 canine, 3 feline) were reported after the July public notification about FDA’s investigation. Some of these reports involved more than one affected animal from the same household. While there are dog breeds (typically large and giant breeds, plus Cocker Spaniels) that are known to have a genetic predisposition to dilated cardiomyopathy, the reports to the FDA continue to span a wide range of breeds, many that do not have a known genetic predisposition. The FDA has received reports of cats with DCM, but due to the low number of reports (10 since January 2014), dogs are the primary focus of the agency’s investigation. For details about the number of reports, visit the DCM Investigation webpage. In cases in which dogs ate a single primary diet (i.e., didn’t eat multiple food products, excluding treats), 90 percent reported feeding a grain-free food. Approximately 10 percent reported feeding a food containing grains and some of these diets were vegan or vegetarian. A large proportion of the reported diets in DCM cases – both grain-free and grain-containing – contained peas and/or lentils in various forms (whole, flour, protein, etc.) as a main ingredient (listed within the first 10 ingredients, before vitamins and minerals). The products included commercially available kibble, canned and raw foods, as well as home-cooked diets." Continuing to follow this closely. FYI, I am going to rename this thread. I'm also leaning towards Proplan for my next dog but will also see what my breeder is feeding. Indy was on Earthborn Holistic grainfree out of necessity for the type of protein and to control his chronic colitis. It was the only food we tried that did not give him diarrhea. His Cardiologist group now recommends against grain free. Indy did not have DCM but he did have increased arrhythmias on his last holter before he died March, 2018. He was PDK4 negative and DCM2 Positive Homozygous. His echo was normal. I have stickied this thread while the FDA investigation is ongoing. Within the group, they chart confirmed cases of nutritional DCM (group members' dogs), and what foods they were eating. By far, Acana and Zignature have been the worst culprits, but Fromm and Taste of the Wild have several cases, and many many others have been implicated. My dogs have been on Proplan for a couple of months now, and are doing great. For what it's worth, I've gone back to ProPlan, as well. Not really because of worrying about DCM (I rarely feed grain free food, anyway) but because so many different dogs just seem to do well on it. We are trying the Focus Salmon and Rice formula, since Leo seems to do better on fish-based foods (although that might just be my imagination). Funny thing is, I fed Bil-Jac, Science Diet, Iams, and/or ProPlan for years and always thought I was feeding good foods, until I became a "better informed" owner. Then came the quest for the "perfect food". So much angst... I was tying myself up in knots. They've been on ProPlan for the past couple of weeks. So far, so good. Additionally, some of the nutritionists' recommendations are going beyond simply avoiding grain-free, to only feeding foods from companies that meet WSAVA standards - that's very few companies. Right now, that is limited to Purina Pro Plan, Eukanuba, Hills Science Diet, Royal Canin, and Iams. Use that information as you will.